Last weekend was chock full. On Friday, I caught Kathleen France‘s guest-star-packed-for-charity show “The Book of Love ” at the Metropolitan Room. Proceeds from the ticket cover price went to ReadNYC.com a literacy program which concentrates on the youth of New York City. The show was fantastic – not only was Kathleen a wonderful, talented and emotionally giving singer, but the guest singers were incredible as well. In attendance to sing their own love-related songs were Terese Genecco, Julie Reyburn, Shaynee Rainbow, and Peter Napolitano (who recited one of his own essays). Tracy Stark music directed and played piano, Sean Harkness played lead guitar, Skip Ward was on bass guitar, and David Silliman was on the drums. Wendy Russell and Joshua Judge provided backup vocals on a number of songs. Okay, about Kathleen. She has a spritely personality and a wonderful voice, which can sing rock, country, jazz, legit soprano, and all with control. She has a depth of emotion right under the top layer of her skin, and was able to beautifully act her lyrics with honest tears in her eyes. She is also a comedienne, able to flip into a funny lyric quite easily as well as keep the energy of a funny song bright and flowing. I loved her choices of songs, which included some original works as well as covers of 1980’s rock. Her opening number of Queen’s “Somebody to Love” was worth the price of admission in and of itself. Kathleen is self-deprecating yet not the victim. She is rightly nominated for Female Debut in the MAC Awards. ‘Nuff said. On Saturday, Pete & I stopped by the Agora Gallery in Chelsea, where Nathan Swaya was about to close his free gallery showing of his lego art. His work is incredibly complex, consisting of 3-D figures made entirely of legos. Some were funny and tragic (a man kneels down, holding the stumps of his wrists up, while two “pools” of what used to be lego hands sit below). Others are quite beautiful, a figure of a human body swimming in water, or a gigantic face jutting out from the wall. His website has a lot of great stuff to look at; however, I was happy to have seen some of his work in person to get a sense of how he utilized lego pieces to create his art. His work can be seen at the Agora Gallery until April 13th (this coming Tuesday! ), and it’s FREE so go if you have time! Look, Ma! 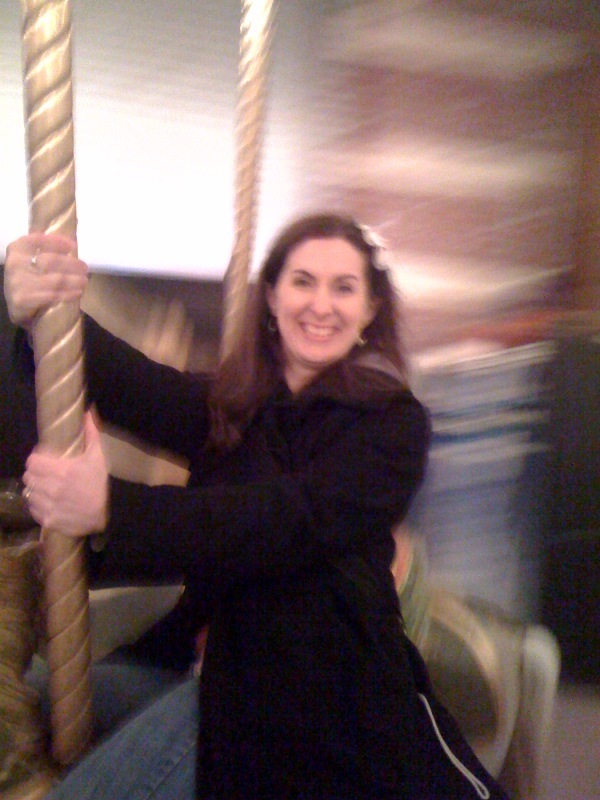 I’m blurry and I’m on a Carousel! So that was Saturday. Sunday was nice and laid back at home during the day, but at night I went to The Salon open mic. I blogged about this evening here, so feel free to read that entry for more info on The Salon that evening – I sang “Zing! Went the Strings of My Heart,” a favorite song of my Dad’s. Monday’s events had been planned ever since last President’s Day weekend, when Pete & I attempted to see the Tim Burton exhibit at MOMA only to realize that we needed to go back to avoid the crowds and absorb everything. We returned to MOMA on Monday, and spent about 3 hours slowly going through all the wonderful sketches. Although I couldn’t take pictures, I did write down notes on my iPhone on some of my favorite pieces. You can see some of his sketches on the official Tim Burton website (I want that “Art of Tim Burton” book, which is 430 pages long! In the meantime, I bought the book that accompanied the MOMA exhibit). I’ve always liked Tim Burton’s visual style and sense of the comically gothic. Ever since I saw Beetlejuice (Beetlejuice, Beetlejuice! ), I enjoyed Burton’s art and unique style. I loved The Nightmare Before Christmas, was fascinated by Ed Wood, Vincent, Edward Scissorhands, and tickled by Mars Attacks and the artistic sentiment behind Big Fish. Although his versions of Planet of the Apes, Batman, Charlie and the Charlie Factory, and the recent Alice in Wonderland don’t thrill me at all (and in fact turned me off as a fan), the big screen adaptation of Sweeney Todd was good and I was entertained by Corpse Bride. In my opinion, Burton fails when attempting to reinterpret someone else’s ideas; he is truly best when he brings his quirky ideas and original stories to the screen instead. 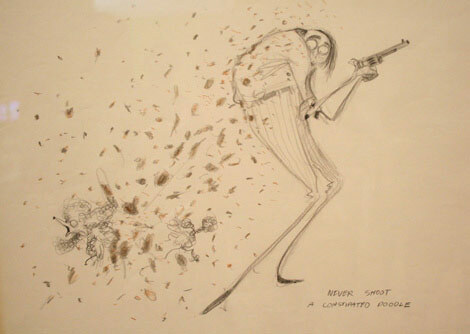 The artwork at MOMA revealed to me just how original Burton’s early work was. I absolutely loved the sketches ripped directly from Burton’s sketchbooks, in particular his creature series and cartoon series (which played on some traditional twists of phrases, like the image of two dogs peering out of the eye sockets of a man as “Seeing eye dogs,” or the loving couple holding each other’s – sawed off – hands). Even the simple outline of a hand with the middle finger saying “I am the only one who can make obscene gestures” made me laugh. He works on themes of monsters, childhood, the grotesque, love, and the often disturbing inner psyche of misanthropes. Skeletons disrobed from their skins, monsters hid behind human masks, and Little Dead Riding Hood scares the Wolf out of the woods. One of my favorite images was captioned “persecution complex,” which featured a miserable creature who was constantly pointed at by multiple hands and fingers…and all the while, the hands emerged from his own body. This theme of being connected to one’s own monster was common throughout his work. Another image portrayed a machine, decorated with familiar mouse-shaped logos, eating colorful unique figures and literally “shitting out” brown boring brown blocks. Burton used to work for Disney…hmmm commentary methinks?!?! The abnormal is always injecting itself into the normal in Burton’s world. Monday night, I also attended the 2010 MAC Award Nominee Showcase for Song & Special Musical Material. Oh and if you haven’t seen already, my group Marquee Five is having one last night of “We Can Make It: The Songs of Kander & Ebb” at Don’t Tell Mama April 15, 2010 at 8:30pm. Reservations and more information can be found at the Don’t Tell Mama website as well as www.MarqueeFive.com.